Indian Railway, finally give boost to the bumper recruitment process overall in India. 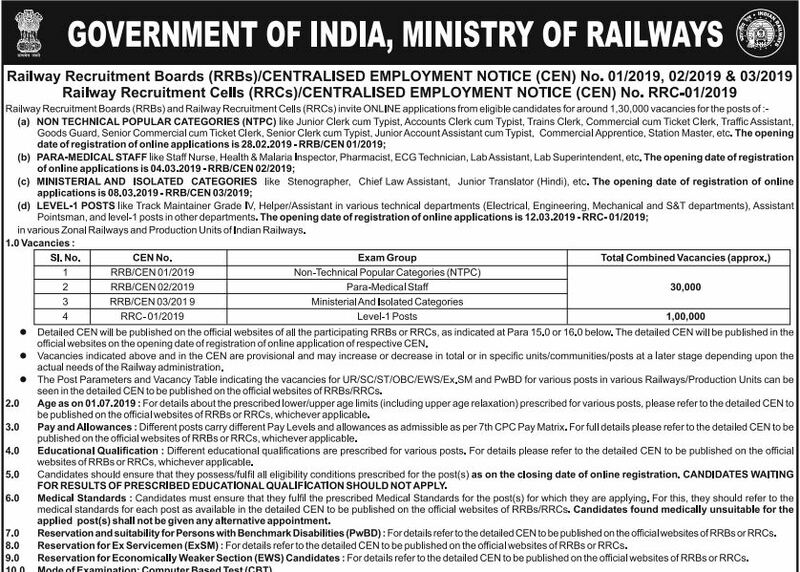 ON 28-2-2019 “Indian railway various department out 130000 vacancies for NTPC, Level 1, Paramedical, Ministerial posts under 4 notification RRB CEN 1/2019, RRC CEN 1/2019, RRB CEN 2/2019, RRB CEN 3/2019 Respectively”. As Railway Minister “PIYUSH-GOYAL” announces 2.50 Lakh additional vacancies in the Railways, says “New job opportunities for 2.25-2.50 Lakh people(10% Quota application) has been created, the process for 1.50 Lakh vacancies is underway. So Railways, in a way, will be providing 4 Lakh jobs by Make multi Notification announcement to fill ASM, TC, Good guard, SSE, Constable, Junior ENgineer, Apprentice, Various posts in 21 RRB Regions and 17 RRC Cells. Indian Railway department share Next two year recruitment plan (Upto end of 2019 Years), that almost 20 Lakhs New employments give to Freshers candidates or any Experienced un-employment candidates on the basis of their qualification and other eligibility. Candidates who wish to do jobs in Indian Railway under railway recruitment 2019-2020 any where in India or within their State/ Division or want to Know Current and upcoming Railway Jobs 2019-20 that is Announced by Railway Department can visit this website on regular basis so that you don’t miss any job notification by RRB’s, RRC, RPF. Note: Interested Job seeker candidates must stay with Us and below you will check every A TO Z Detail related to RRB Railway Recruitment 2019.